The 2018 midterm elections are nearly a week away, and like many of you I have been refreshing the latest polls from FiveThirtyEight, eagerly waiting for the site to tell me who will win in November (it won’t). 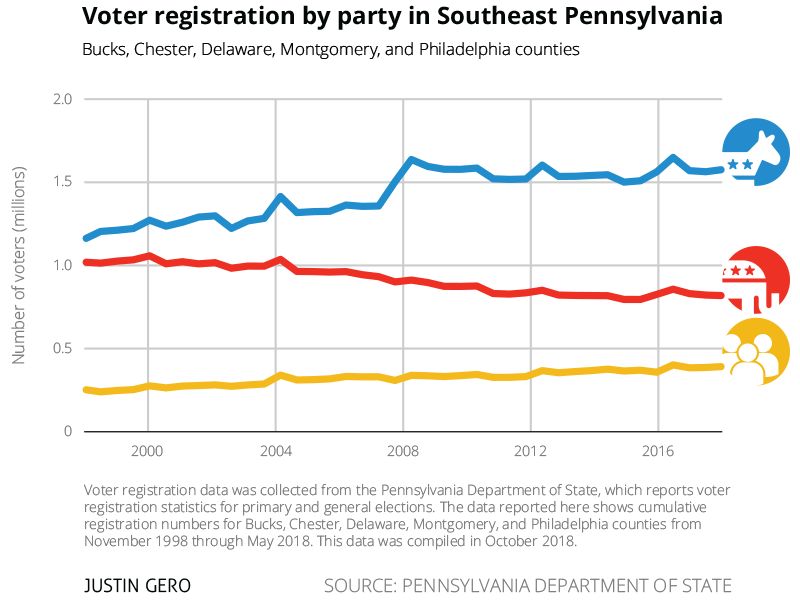 My interest in the upcoming election made me want to dive a little deeper into the local political landscape, and that brought me to voter registration statistics from the Pennsylvania Department of State. The department manages elections in the commonwealth, and has voter registration data posted on its website going back 20 years. The data breaks down voter registration by party and county for primary and general elections. For this post I’m looking specifically at the five counties in Southeastern Pennsylvania: Bucks, Chester, Delaware, Montgomery, and Philadelphia. I wanted to look at voter registration data because increasingly party identification is predictive of how an individual will vote. “At the individual level, there is a clear correlation between partisan registration and partisan identification,” stated a recent report by the Pew Research Center. “An overwhelming share of voters who are registered as Democrats or Republicans also identify with or lean to that party when asked in surveys.” Pew’s research showed that party registration correlated with party identification for between 86% and 92% of voters. However, its important to understand that there are limitations to what this data can tell us. Voter registration information alone is not predictive of election results. Just because someone is registered to vote doesn’t mean that they will vote or that they will always support their party’s candidate. Take for example the 1999 Philadelphia mayoral election. Despite Democrats having a over half a million more registered voters in the city, Democrat John Street narrowly won by just 7,228 votes. Candidate quality, fundraising, and other factors will be in play for every election, but understanding voter registration data can also help us understand which party may have an advantage. Over the last 20 years there is an overall trend in the Delaware Valley that appears significant: Between November 1998 and May 2018 the number of registered Democrats and independent/third party voters has increased while the number of registered Republicans has decreased. The biggest shifts toward Democrats and “other” voters are in presidential election years: 2004, 2008, 2012, and 2016. In November 1998 there were 1,160,099 registered Democrats and 1,020,217 registered Republicans in Philadelphia and its four Pennsylvania suburban counties. A difference of just 139,882 voters. At that time registered Democrats accounted for 47.66% of voters, Republicans 41.91%, and independent and other parties accounted for 10.43%. As of May 2018 there are now 1,575,304 registered Democrats, 818,789 registered Republicans. A difference of 756,515 voters. 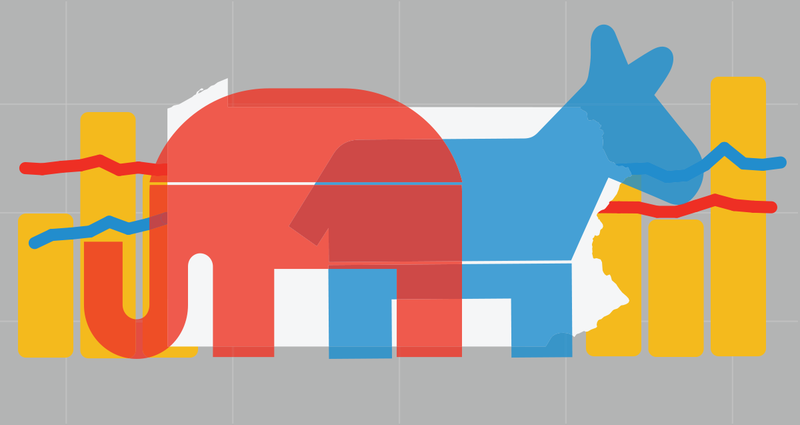 Democrats now account for 56.55% of registered voters, Republicans 29.40%, and other voters 14.05%. The most significant change in voter registration and party identification occurred in 2008. 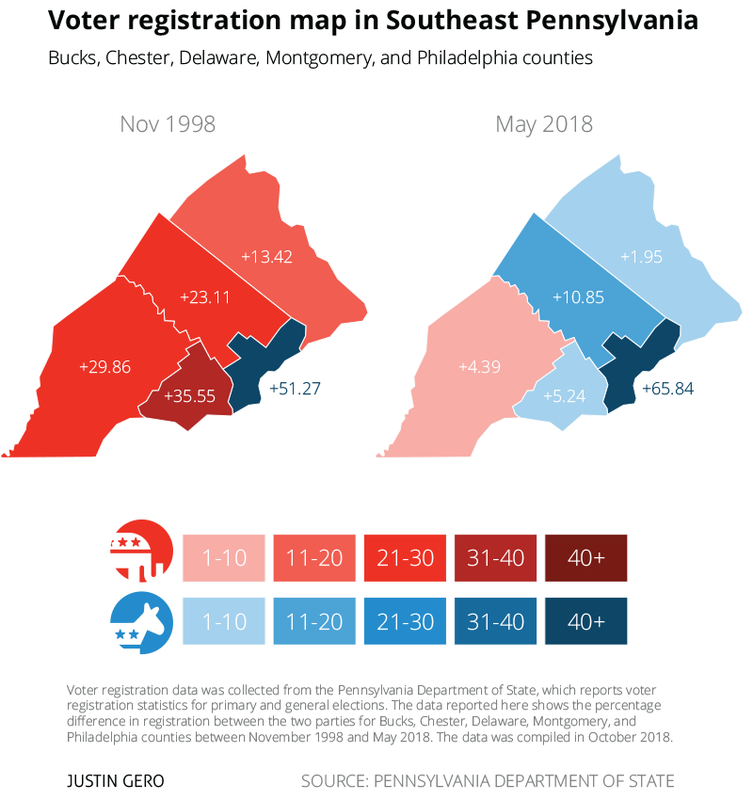 In just one year (November 2007 to November 2008), the number of registered Democrats in Southeastern Pennsylvania increased by 279,554 while during the same time the number of registered Republicans decreased by 20,716. Barack Obama’s campaign strategy was in part to activate new voters, and this data may be evidence of that success in the Philadelphia area. Perhaps most significantly, these registration gains have been greatest in the Philadelphia suburbs. While the city has increased both the number of registered Democrats and the party’s registration advantage over Republicans (from 7:2 to 8:1), it is the formerly ruby-red suburban districts that have made the biggest swings toward Democrats. Bucks and Montgomery counties moved into the blue in 2008. Delaware was next in 2012 (then back to Republicans before going to Democrats for good in 2014). Chester County is the last county in the region with a Republican registration advantage, and even there the advantage has been cut to a fairly narrow margin. In the last 20 years the number of registered Republicans in Chester County remained about the same, while the number of Democrats in the county doubled. Earlier this year, the Pennsylvania Supreme Court struck down the state’s congressional districts. Looking at the maps above it becomes clear why gerrymandering was vital to the Republican strategy of holding onto the Philadelphia suburbs. Pennsylvania’s 7th was particularly infamous for its odd shape, sprawling across the map throughout Berks, Chester, Delaware, Lancaster, and Montgomery counties. This is a common tactic of gerrymandering known as “cracking” when politicians divide up opposition voters into separate districts to dilute the power of their votes. The other gerrymandering tactic is known as “packing” when one side is given a supermajority in one district so the other side can spread its voters out to maximize its representation. Democrats are often accused of naturally “packing” their voters in cities just by where Democrats decide to live. However, looking at the 2018 map, it suggests that while Democrats have “packed” votes in Philadelphia, they have also increased registered Democrats in the suburbs as well. It may suggest a more regional than purely metropolitan “packing.” These voter registration numbers also show us why Democrats are favored to pick up congressional seats in Southeastern Pennsylvania now that a newer, cleaner district map was drawn. The biggest changes for both parties occur in presidential voting years. The peak number of registered Democrats was in November 2016, followed closely by November 2008. The peak number of registered Republicans was in November 2000, followed closely by November 2004. There are now fewer registered Republicans in Philadelphia County than registered “other” voters. I’m interested to see the registration numbers after this year’s general election (November 6), and perhaps will post an update.